Every day a lot of travelers make the well known 2 days and 1 night slow boat journey from Houay Xai at the border with Thailand to Luang Prabang. It is especially common within the backpacking ‘community’ for various reasons that we didn’t completely like. Apparently the scenery along the Mekong River is amazing and that would have been the only motive that might have pushed us on that boat, unfortunately it wasn’t enough to make us join the masses and see what all the hype was about for ourselves. We chose not to take the slow boat because it would have taken 2 entire days of traveling to add on top of our journey of getting to Houay Xai from Chiang Rai, because it was more expensive than the bus, because we read it’s usually overcrowded and there aren’t seats for everybody and also because it is well know as a ‘party’ boat, where often people drink to overcome the boredom, something that didn’t particularly attract us. So as soon as we got our Lao Visa sorted we decided to make our way to the bus station which is about 6 km away from the border crossing point. Finding a tuk-tuk was easy, trying not to get scammed was a little bit harder. In fact the driver tried, as usual, to overcharge us and decided to be fair only when we were about to get off the vehicle and find another one. If you’ve been to Southeast Asia, I’m sure you are more than familiar dealing with the fact that there aren’t set prices, that almost everybody tries to get as much as they can out of your wallet and that it’s up to you trying to bargain for an honest and reasonable charge or pay what you are told. We were simply tired of it, so we decided that this time we wouldn’t pay the extra, even if it wasn’t going to break our bank accounts. This was the question we asked to the tuk-tuk driver when he dropped us off to what seemed more like an old and forgotten bus station, with a couple of buses that looked like they’d seen better days and only few people around – mainly locals that couldn’t take their eyes off us loaded with our backpacks. The only way to find out if we were in the right place was to try to ask for some information about a bus going to Luang Prabang. We were even ready to stop for a night in Houay Xai if necessary in case the buses had already left or were fully booked. So naive of us, we didn’t know yet what we were about to experience, only later would we realize that booking a seat would have been completely unnecessary. Wait and see why! There was a local bus to Luang Prabang ready to leave in the next minutes, how lucky was that? So we quickly bought the tickets – only 120,000 Lao Kips (approximately £10, $15 and €12) compared to the 220,000 for the slow boat – and made our way to the bus … hang on which bus? The only one that we could see was ready to leave looked like a bus from the 50’s and was already full to bursting with people. What did it happen to the long journey buses we were used to? Anyway it was too late to change our minds, with tickets in hand we got on and – after walking on huge bags of rice that filled the entire aisle – we found the last 2 available seats on the very back row fortunately close to the window. We soon noticed that there was no air conditioning (I guess it was too early for such high technology in the 50’s :)), that everybody was giving us odd looks and we were the only 2 farangs and English speakers on that very local bus. We exchanged a quick glance that said everything: Where the hell did we end up? Finally the bus left the most dusty bus terminal I’d ever seen to that point, but before even going 500 yards it stopped again only to let more people on each with another enormous bag of rice. Where else could they possibly sit if there aren’t any more free seats? What a silly question. On the bags of rice of course! To that, more and more stops followed until there wasn’t even a small little space free, we thought those people needed just a short ride somewhere along the way, but we were wrong, they were heading all the way to Luang Prabang too. Everyone had a bags of rice or cereals with them, the baggage storing area was full like the corridor, so they started to put their possessions on top of the bus trying to secure them with ropes. We also stopped for ‘toilet’ breaks, where no actual toilet existed. Men easily used any available spot along the street to do their business and the women tried to find a bush, a tree or used their sarong to cover themselves. We simply chose to not drink too much, only a sip every now and then to stop our throats drying out. There were children (some of which still babies drinking milk from their mother breasts), old ladies and old man sitting or lying in the middle between the seats, each and everyone of them trying not to fall off at every curve and finding it hard to snooze thanks to the bad conditions of the roads which are incredibly bumpy and wind around the hills. The seats were very uncomfortable but we didn’t complain and felt lucky we had one. The bus was very hot despite having all the the windows open that let all the dust came inside. The roads were pretty scary in some points and it looked like we were about to fall down the steep mountains we were driving through. On the way we encountered a couple of very bad accidents that involved trucks and burnt out buses, in fact how could a bus and a truck possibly drive through such narrow roads at the same time? I’m not sure how, but we managed it few times. I tried not to show Dale’s my worries and anxiety but it was inevitable. The answer is yes, it could and it did. In fact we stopped 3 times because of a puncture, you should have seen how they changed the tyres. I have to admit it was pretty amazing, they did it by using a simple iron bar and you could tell they were pretty much used to such accidents. The dark came pretty soon, and we found ourselves parked somewhere while the driver had a nap, the other guy got the tyre with the puncture fixed and we managed to buy some plain sticky rice to keep our tummies happy. At that point Dale was starting to lose his temper while I was trying to calm him down explaining that it was probably best for the driver to recharge his energies than to get all of us into an accident. …We finally made it to Luang Prabang, very tired, very dusty, in need of a shower and a coffee but happy to be alive and to still have our backpacks with us. If I look at it now, it was very dangerous at points, but the view we got to enjoy before the pitch dark arrived was fantastic. We drove through mountains, various hill tribe villages where normal people go about their daily lives, having a wash in the rivers or on the side of the street with the help of a bucket. Half dressed children or some naked but for a pair of shoes would watch as the bus went by. You could tell how poor those villages were, some of which had no electricity, the bamboo huts where people lived looked so fragile and easily breakable. The landscape was very scenic, raw and dusty, very dusty! The whole experience gave us a taste of the real Laos, I don’t think it could have got any more local than that, don’t you agree? Which would you chose to take? The slow boat or the bus? The bus should have taken only 12 hours if I well remember, but the trip took way longer than expected in the end. It was incredibly tiring but definitely an experience. Best of luck Serena for your trip. This is a truly fantastic tale! It’s so funny how it is often the most difficult moments in travel that become the best stories and the ones that we tell throughout our lives. I am familiar with the slow boat but this was my introduction to the slow bus and knowing that it took you through hill tribe villages has actually left me smiling and at least a little envious. Thank you for sharing the details! Thank Mary! Driving through villages was definitely the highlight of that bus ride and it kind of made up for the terrible and uncomfortable trip. If we ever go back to Laos one day we should try the slow boat. Nice post and great blog! Really like that you guys didn’t do the “mass tourist” thing, that kind of stuff makes us sick too. Thank you so much Frank for your kind words, it makes us happy to know that you enjoyed the post and liked the blog too. We tent not to get into tourist trap as much as we can, sometimes though it’s inevitable. Pretty much looks like my idea of a nightmare! Think it’s safe to say I’d take the slow boat, especially with my kid. Also, I had a friend who took the slow boat a few years ago, and had a great time! Definitely looks like you got a taste of the ‘real’ Laos! We would take the slow boat if we were doing it again, we don’t regret taking the bus though despite the tiredness and the discomfort. It was an experience and you’re right Melissa, we got to taste the ‘real’ Laos. I’m exhausted from just reading about your bus adventure. It’s good to read that you can appreciate the positive side of your unique adventure. I had to smile reading this post. And how about that leg room huh? Dunno how you both fit next to each other w/o doing an angled sit. lol. Bathroom breaks were a culture shock– we had many throughout the night with people scampering into the bushes in the dark. Did you say bathroom breaks? Which bathrooms? LOL The leg room was ok for me being small, but Dale suffered. I feel like you can’t say you’ve traveled Asia until you’ve taken one of these (maybe just because I’ve watched too much Amazing Race!). 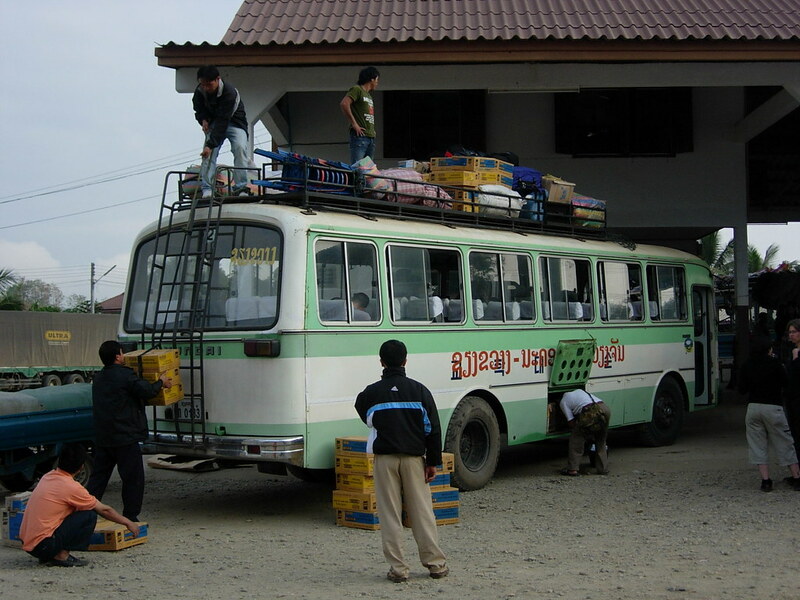 When I was in China, we hired a guide with a bus once we saw how horrifically packed the local buses were! You are probably right, I guess it’s possible to avoid these kind of trips while traveling through Asia, but it’s also so easy to end up in one of these buses too. I heard in China, trains can be even worse than the bus we were on, is that true? At the end of the day if we want to do what the locals do, we have to be prepared to this kind of experiences in some countries. Hahah the joys of traveling in Asia! Sounds like something you regretted at the moment but you’re glad you experienced now. You guys have way more patience than I do!! I’m not sure I would have been in the best of moods after 18 hours of that, but way to have a positive outlook and focus on the experience and views it provided! I know what you mean Casey. While the driver was having a power nap in the middle of the night, adding extra hours to our already long journey, Dale started to loose his patient. It was a proper though trip but we tried to find the good into it, especially after we got off that bus. Oh dear, that reminds me of the buses in Cambodia. They also always fill up, but people don’t usually sit on rice bags. The bus company hands out tiny little children’s stools to place in the aisle. It is hilarious. We haven’t been to Cambodia, but we heard of those bus rides. Knowing us, if we ever make it to Cambodia, we are likely to end up on one of those buses, ehehheh! Wow — what an adventure! Given the look of those tires it’s amazing they lasted the journey as long as they did. The rice bag seating is amazing (if you’re looking at a picture of it instead of imbibing). What a terrific/offputting/ultimately worth it way to see a country. You couldn’t put in a better way Terry! Despite the unusual trip, we did see some amazing landscapes, tribe villages and local life scenes that otherwise we would have ignored the existence. We ended up avoiding the boats (for the same reasons you did) and taking a bus north from Houay Xai to Luang Namtha. We had time to investigate options, because we were in Houy Xai a couple of days after our trip up to Bokeo Natural Preserve. We spent a few days in Luang Namtha before getting a shared van to Luang Prabang. It was quite a ride, but only one break-down if I remember correctly. We got pretty lucky on that route! Glad you made out ok after all, and it made for a good story! oh my gosh! that last photo says everything. Endurance!! Ahahah! Pretty much, we were knackered! What a grim photo of you guys! Congratulations on surviving that chicken bus. I took one in Costa Rica that at one point led me to squeeze one of my kids and tell her “Mommy loved you, remember that!” LOL. …By the way, hope you finished that book. Now you can read the Dunk and Egg novellas, get you up to speed on the Blackfyre theory. I know Jennifer, that ‘fantastic’ picture of us tells how tiring that bus ride was, having been on a similar kind of bus you know what I’m talking about. Ahhhh I’m tempted to laugh, but only in a “been there, done that” sort of way 🙂 Few times in Bulgaria, Macedonia and Turkey, and more once in Mexico (although the buses here are normally first-class and you have the option to take the crap bus if you choose). I’m sure the experience was something, and certainly worth writing about, but I’m not a fan of buses without AC or jam-packed. My favorite so far has been getting on the subway in Sofia, Bulgaria and finding a gypsy farmer sitting with a burlap bag full of at least 10 squawking chickens =P in the heart of the city…one thing to see it out in the bush, another in “civilized” land! Don’t worry Tim, if we rethink about it we giggle too, when we were on that bus though we couldn’t really bring ourselves to laugh. As you said, looking at bright side the whole experience was definitely something, probably not to repeat. I kind of miss this kind of travel. I did this for over 1.5 years way back when. And towards the end swore never do it again. Gratefully with kids, I can’t do it! even though the expereince is great an you have a good story to write, but I remember how tough it can be. I think I would have gone for the boat since I love the water. That looks like a hellish bus ride! Fair enough Val! If we would have do it again one more time, considering we already experienced the local bus ride, we would probably go for the slow boat too.